If you didn't catch the new 'Supergirl' sizzle reel during CBS's 'Scorpion' season premiere you can enjoy it below. It features "never-before-seen footage" of the upcoming season including battles with alien criminals that were released when the Kryptonian prison Fort Rozz escaped the Phantom Zone and landed on earth. The 75-second video is a far cry from the misguided first teaser that emphasized a rom-com vibe. Since then all subsequent trailers have focused on Kara Danvers (Melissa Benoist) in full Supergirl mode. The show has lighter moments, she's no brooding superhero, she enthusiastically relishes her role as a Superman's cousin. Her desire to do good adds to her appeal and all her powers on display this season as teased in the trailer. 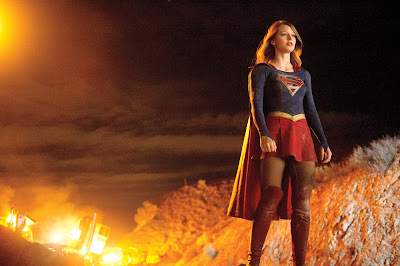 Supergirl premieres Monday, Oct. 26, at 8:30 p.m. before moving to its regular time slot at 8 p.m., Mondays on CBS. Before Supergirl soars into homes on Oct. 26, take a look at exclusive footage from future episodes of the highly-anticipated CBS show.